LOW MILES* VERY CLEAN !! GREAT MPG! 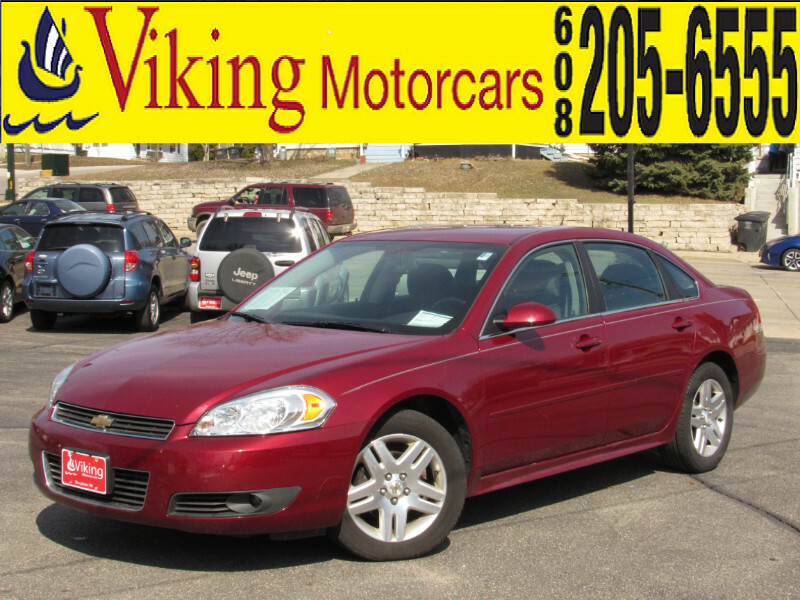 way power driver's seat, OnStar hardware, 4 wheel ABS disc brakes WITH traction control, dual front AND side impact airbags, remote illuminated entry and TOO MUCH MORE TO LIST are waiting for you in THIS 2011 Chevy Impala LT. This ONE OWNER NEW ARRIVAL has been thoroughly inspected and reconditioned in our shop so you can buy AND drive with TOTAL CONFIDENCE! All Viking Motorcars come with 3 months 3,000 miles limited powertrain warranty, 12 months 24/7 roadside service including emergency gasoline, jumpstarting, towing AND lockout service, 2 keys AND owner's manual and FREE CARFAX REPORT! Our local credit union financing starts at 3.99% APR and you can apply on our secure web site. We invite you to shop Viking Motorcars, your hometown dealer with smalltown prices WHERE WE ALWAYS TREAT YOU RIGHT! Located at the intersection of highways 51 and 138 south in HISTORIC downtown Stoughton. Visit Viking Motorcars online at www.vikingmotorcars.com to see more pictures of this vehicle or call us at 608-205-6555 today to schedule your test drive.